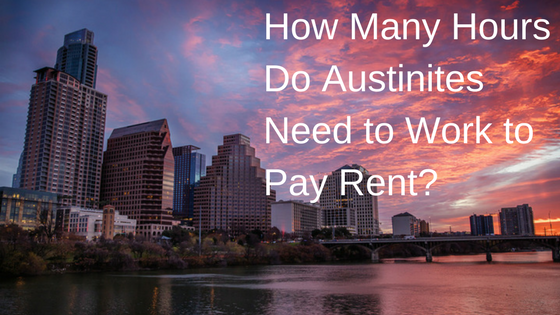 How Many Hours Do Austinites Need to Work to Pay Rent? 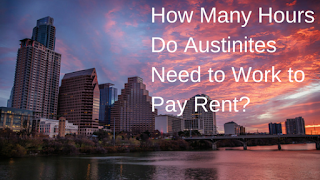 How many hours do you have to work to pay rent in Austin and other Texas cities? Austin Culturemap reports on findings by SmartAsset. The numbers were reached by examining the annual take home pay, average hours worked annually, and median rent for each city. Statistics came from the U.S. Census. To calculate how many hours residents have to work, they divided the median rent by the average hourly wage. Austin residents have to work 64 hours a month at the hourly wage of $18.64 to make median rent of $1,194. That put Austin in the 13th spot on the list. San Antonio dwellers have to work 64.3 hours at the lower hourly wage of $14.36 to pay the median rent of $924, making it number 12. Houston was number 10, largely due to residents low average earnings ($31,060 annually, or $14.36 per hour post tax). Houstonians have to put in 66.3 hours to cover their rent of $952 a month. Dallas was number 11 with residents needing to work 64.5 hours at $14.50 to pay median rent of $935. Fort Worth ranked 15th and residents have to work 63.4 hours at $15.36 to cover the rent of $974. El Paso was the most affordable Texas city. Residents there enjoy paying just $778 for rent and can cover their housing costs by working 63 hours at $12.36 per hour. Looking to find an apartment that fits your budget in Austin? 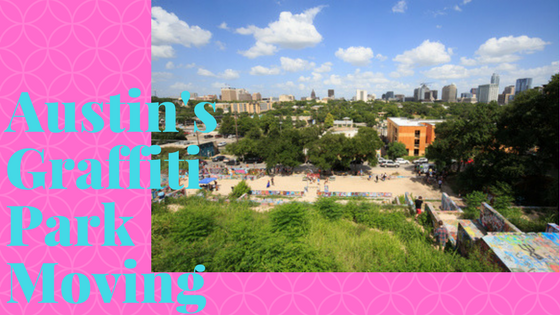 Apartment Specialists South Austin can help! Give us a call today at 512-912-8000! Austin has made yet another top 10 list. This time it’s the top 10 cities Millennials are moving to in the United States. Business Insider reports on findings by the Brookings Institution. Austin ranked number 6 on the list. 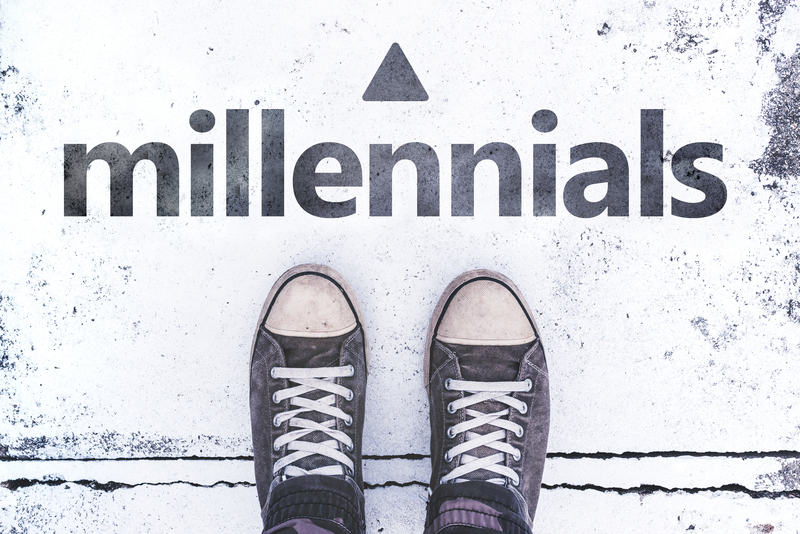 Our metro population is 2,000,860 and about 544,234 of those are millennials. Austin’s increase of millennials from 2010 to 2015 was 11.8%. Two other Texas cities made the list. Houston tied Cape Coral, Florida for the 7th spot. 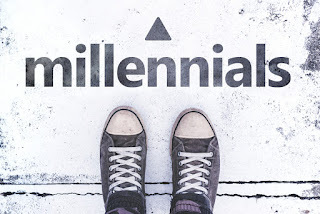 Houston’s metro population is 6,656,947, they have approximately 1,650,923 millennials living there, and their population of millennials increased 11.7% between 2010 and 2015. San Antonio was number 2 on the list, with an overall metro population of 2,384,075, 598,403 millennial residents, and an increase in their millennial population of 14.4% between 2010 and 2015. No matter what generation you’re a part of, Apartment Specialists can help you find the perfect apartment, for free and in no time at all! Give us a call at 512-241-1111 today! Austin’s Graffiti Park is moving from its current digs, a bunch of abandoned foundations that were laid for condos in the 80’s before the market went belly-up, to Carson Creek Ranch, the Austin American Statesman reports. The developer will have to document HOPE Outdoor Gallery before demolition can start. The park will stay open through June while the developers create a timeline for construction on the new project. The developer has delayed construction on their project until HOPE found a new home. Their new home will be six acres with over 48,000 square feet for artists to use as their canvas. The new home should be open by the end of 2019 and will include restrooms and other facilities that HOPE’s current space on Baylor street just doesn’t have. Looking to make your own move in Austin? Austin Apartment Specialists can help! Give us a call today at 512-241-1111 to find your dream apartment in no time!